When I look back on some of my old posts from the joinery shop, I see that we used hand tools to make everything. Now that’s history because Andreu, Michael, Rod, Zac and I spent the last week under the watchful eye of Ian, building tables for our routers. but this only scratches the surface (sorry) of the capabilities of the router and router table combo; my planes are now gathering dust on the shelf. 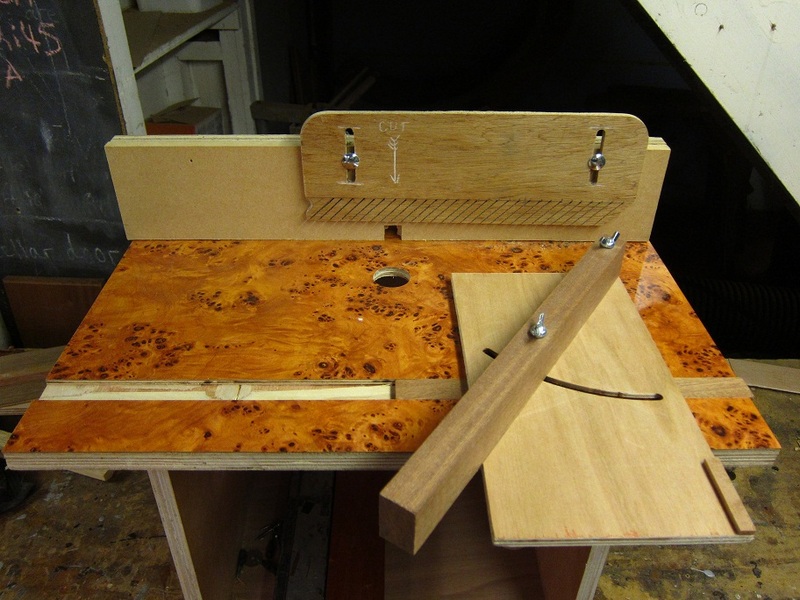 The router table went together very quickly, and the router itself was an essential part of its construction. Many grooves not extending to the edges were cut, and even some that did reach the edge (also known as ‘rebates’). When it came to putting the surface on our table tops, there was a bonus: Ian brought out some sheets of walnut Formica that were ordered specially (or was that ‘found in the back of the cupboard’?). When we’d built the tables, Ian showed us some of its capabilities; which are quite extensive. You can spend a fortune on router cutters and jigs to cut letter boxes, kitchen work surfaces dovetail joints, skirting boards, tongue and groove, the list goes on; in fact Axminster have a whole section just on routing (none of their router tables have walnut tops though). While there’s not much that can be done to avoid the cost of cutters, Ian encouraged us to think about making our own jigs as attachments to the table. He showed us a whole range of jigs that he has made over a lifetime in joinery and hinted at some he has made that no one else has thought of yet; but we didn’t get to see them. My first job after the router table workshop was to shape some more timbers for Naiad. Normally I’d reach for my plane for this job, but I thought I’d see if I could do it on the router table. A fair amount of trial and error was involved, and some of my test pieces got a bit chewed up, but once I’d got it set up, I was churning out shaped timbers at quite a lick (and I still have all my fingers). It got me thinking about my first idea for a jig which would make the setting up quicker; but it’s still on the drawing board; I expect Ian already has one.